Fun volleyball drills are great for keeping players from volleyball burn out. The club volleyball season can be very long. 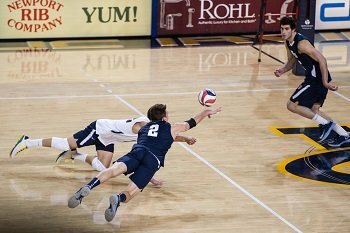 Designing volleyball drills that allow players to be creative (example, playing 2 on 6) can be a great break from constantly trying to perfect techniques. Start with two volleyball players, one lying on top of the other. The coach slaps the ball, and tosses the ball high into the court. At the slap of the ball, the players unpile and the player on the bottom goes to the ball to make a pass. The player on top moves to get in position to set their partner. After the pass, set, and hit the volleyball drill starts over with the next two players. This drill is great for quick reaction and player communication. Playing 2 on 6 may seem unfair at first, but this is a unique and fun opportunity to learn various defensive skills such as reading setters and hitters, communicating with your teammates, and making defensive plays often in awkward ways. Because of the unique challenges of playing 2 on 6, this volleyball drill is great forchallenging volleyball players that are already highly confident in their playing ability. For example, a great defensive player can find having the responsibility of covering the entire court with only one teammate extremely difficult. This unique challenge builds character and forces the player to raise their standards for success. The volleyball drill starts with a player serving the ball underhand with one player on the other side of the net ready to receive the serve. Each side gets only one hit and the volleyball players must play the ball with their forearms with their hands held together (no one arm contacts) on every hit. This ends up looking like a tennis volley with each player running across the court returning one anothers passes. If the server wins the volley, the server switches sides taking the place of the player receiving the serve. If the receiver wins the volley they stay on their side and are awarded a point. This is a good warm up drill because players are forced to run all over the court to play the ball. A good way to do fun volleyball drills is to keep individual scores. One version of the drill is to play to 5 points. To make keeping score easier each player keeps track of their own score. Also, the server often has a big advantage when starting the drill because there is a lot of court to place the ball into. For this reason, its a good idea to have a rule that says you only score a point if you win the volley when you are on the receiving side. Where does winning fit into your coaching philosophy? Playing doubles gives kids the opportunity to work on anticipation skills and learn how to think for themselves because they are finally playing without a coach. Two on Two queen of the court is basically playing 2 on 2, with the winners keeping the court. Like the 1 on 1 warm up drill, the team that wins the volley takes the receiving side of the court. To make scoring more difficult, you must be on the receiving side to score a point. For example, Each time the receiving team wins the volley they get a point. If they lose the volley, they leave the court and must remember their score. Games are usually played to 5 points. Playing 2 on 2 are fun volleyball drills and are a great break from 6s. The strategy is much different in every phase of the game. Passing is much more difficult because there is more court to cover. Defense is much more difficult than in 6s because theres no block. If you do decide to block, your partners responsibility of covering the rest of the court is extremely challenging. Playing 2 on 2 in practice drills can be used when practices have become boring or stale. Because of the unique skills and strategies of playing 2 on 2, players are forced to think and be creative in a much different way than when playing 6's. The purpose of this volleyball drill is to get volleyball players to hit around and through a block. This volleyball drill needs 5 or 6 blockers on one side of the net with a setter and hitter on the other side. The setter sets the hitter and hitter must hit through or around the blockers. The hitter cant hit over or tip over the blockers. This drill can be great for training hitters to see the block. The setter can intentionally set the hitters tight so the hitters can work on swiping and tooling the ball off of the blockers hands and arms. Hitting is one of the most fun skills in volleyball. Most volleyball teams enjoy fun volleyball drills involving hitting.